With The Sorcerer’s Apprentice (2010), producer Jerry Bruckheimer was associated with a rare box officer underperformer. While doing well overseas, the film failed to capture a large audience in North America. Even before its release, the film was plagued with bad press as two separate car accidents resulted in injured pedestrians during principal photography. Not to mention, no one was particularly chomping at the bit for a live-action remake of a segment from the beloved animated classic Fantasia (1940), especially starring king of the paycheck movies Nicolas Cage, and Jay Baruchel, a young actor known mainly for playing awkward, geeky teenagers (She’s Out of My League). Upon release, it soon became apparent that the only films that mainstream movie-goers wanted to see with magic in it had Harry Potter in the title. While chasing after a note intended for a girl at school that he likes, a young boy enters a magic shop and meets a powerful sorcerer named Balthazar Blake (Cage) who tells him that he will grow up to become a powerful wizard. He also witnesses a brief battle between Balthazar and a rival sorcerer, Maxim Horvath (Molina) that traps them both in an urn. Ten years later, Dave (Baruchel) is a brainy but socially awkward college student and he ends up running into his grade school crush, Becky Barnes (Palmer). She’s grown up to be quite the beauty and even DJs at a college radio station. At the same time, Balthazar and Horvath are freed from their prison and seek out Dave who was the last one to see the Grimhold, a magical object that houses all kinds of evil sorcerers. And so the race is on to recover this object and stop Horvath from resurrecting Morgana le Fay (Krige), a very powerful sorceress capable of destroying the world. Nicolas Cage and Jay Baruchel play well off each other with the veteran actor playing the straight man mentor to the younger thespian’s wisecracking apprentice. They banter back and forth as Balthazar shows Dave the magical ropes as it were. Cage plays it safe for the most part but does give the occasional eccentric flourish. Baruchel seems to be channeling Woody Allen at times but is surprisingly not all that annoying most of the time as he acts as the audience surrogate. Like he did with the popular National Treasure films (which also starred Cage), director Jon Turteltaub keeps things moving at a brisk pace, never allowing lulls between action sequences to last for too long which should be ideal for the target audience of hyperactive children. He’s aided by some pretty snazzy CGI that brings the many acts of sorcery vividly to life. Ultimately, The Sorcerer’s Apprentice lacks the emotional depth and intricate plot machinations of the Harry Potter films. It is entertaining enough, I suppose, and a good time waster for the whole family, but it just doesn’t have that special something that makes it a truly memorable film. “The Making of The Sorcerer’s Apprentice” is a standard featurette that takes us through the genesis of the film. 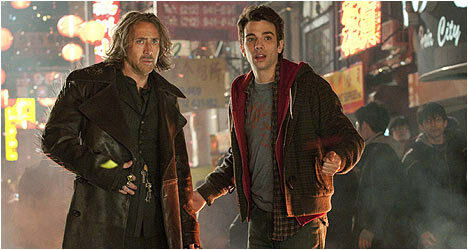 Producer Jerry Bruckheimer is a fan of classic magic and wanted to bring it and update it for a contemporary audience. We see lots of behind-the-scenes footage of the cast and crew shooting on the streets of New York City. Also included are several featurettes covering various aspects of the production, from working in the city, the mixing of science and sorcery, the use of practical effects, the link to Fantasia, an interview with actor Toby Kebbell who plays Las Vegas-type showboating magician, and so on. There are deleted scenes that document Balthazar attempting to recruit Dave as his apprentice, an classroom science experiment that goes awry for Dave and his awkward social skills when it comes wooing Becky. Also included is an “Outtakes” reel of the cast members blowing their lines and goofing around.